My books have been described as James Patterson meets Dan Brown. My characters are vivid and strong. I enjoy writing historically accurate novels because I learn so much in telling the tale. I take pride in creating a mental picture that enhances the reading experience. Please enjoy. The Book of Frank, "Great action military story with a twist. Also has a very realistic plot line. Will leave you wanting more and the sequel is just itching to be told. I can't wait A++++ story." Charlie's Requiem: A Going Home Novella, "Excellent book!!!! Hard to put down after you start on it. Only wish it would have been longer. Really looking forward to more stories about Charlie and all the other great characters." 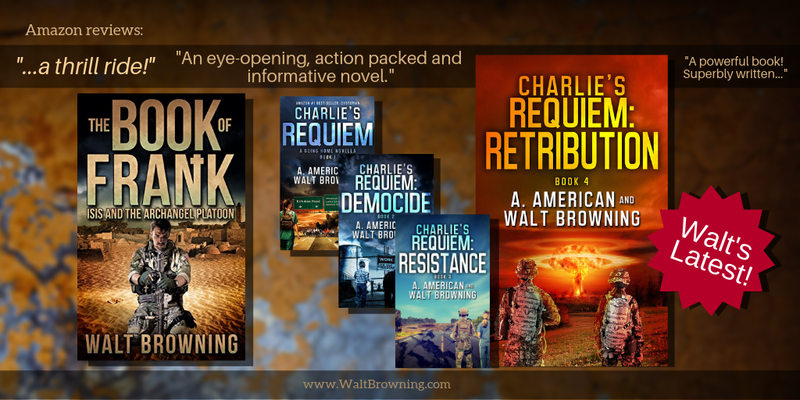 Charlies Requiem: Democide, "Another home run from these writers. Keeps you holding on until the end, leaves you spellbound with anticipation throughout ever chapter. Will be waiting patiently for the next book in series." "Both Charlie books are excellent. The plot is well thought out. There are twists that take you by surprise. The characters are so well developed that you feel as if you know them. A believable story."